Fun? Yes! It balances all the hard work you do! Add some fun to your routine! Yes – fun! We work hard every day – work, family obligations, chores, shopping. It’s important to balance all that hard work with fun. I work out so that I can have fun my way! This is a terrible picture! Both Tango (my Brussels Griffon) and I are out of focus because we’re moving. But I think you can see that Tango is looking up at me and having a good time. I train my dogs not just because a trained dog is a happy dog, but because I enjoy it. The ribbons that we get and the titles that we earn are just a reflection of the enjoyment we both get out of the experience. I’ve said it before – I work out 4 or 5 times a week, and a couple of those times are running. 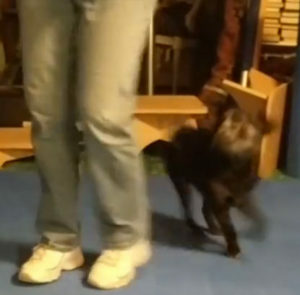 I hate running, but I do it so that I can have the endurance I need to run Booker (my other dog – a Boston Terrier) in agility – which I do love to do. I don’t work out for the sake of working out. I do it because I want to do other things. I want to have fun on my terms. Yes, sometimes that fun is reading on a lazy Sunday afternoon. Or napping… But more often that fun is training my dogs. Whatever puts a smile on your face. I wasn’t going to train my dogs this morning since we have a house guest (and her three dogs) and things are a little crazy, but Booker insisted. And I’m glad I took the time because no matter how stressful the rest of my day is, I had fun before work! What’s your fun? Walking in the park with a loved one? Running around in the back yard with your dog? Reading a good book? Taking a cooking class? Whatever your fun is, make sure to incorporate it into your day! Every day! It makes you happier. And that leads to better focus and productivity in other areas of your life!